Stock Market Bubble - What Does It Mean? What is a "stock market bubble"? 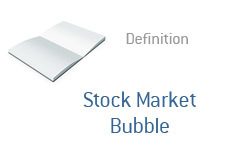 What is the definition of a "stock market bubble"? What causes a "stock market bubble"? There is a saying that "water seeks its own level". What does this mean exactly? It means that, despite short-term fluctuations higher or lower, the markets will eventually determine the proper value of a security. If a stock's proper value is $10 but it is being pumped up by speculators and is currently trading at $25, then you can rest assured that the stock price will eventually trend towards its proper value. This is the same when it comes to the markets as a whole. If speculators and over-eager investors are pushing the overall value of a market beyond its proper value, then the market is said to be in a "bubble". Think back to the dot-com bubble of 1999-2000. The markets became disconnected from reality as the investing public piled into dubious dot-com stocks. Many of these companies were worthless and had nothing in the way of a sustainable business model, but investors didn't care, driving the NASDAQ to over 5,000 points. Were the underlying components of the NASDAQ really deserving of a multi-thousand point gain in just a short period of time? Of course not. This was a bubble, and eventually everything came crashing down. "Water seeks its own level." Usually the culprit is a "herd mentality". A person hears that their neighbor is investing in the markets and doing really well, so suddenly they want in too. Before you know it, millions of people are suddenly plunging their money into equities (or gold or whatever else is the flavor of the day), and the market reacts accordingly. That's a stock market bubble, and we have seen many during the history of the DJIA, NASDAQ and S&P 500.